Resell domains to your clients or register your domain name for personal use, full control over domain, transfer, renew, update DNS records, email forwarding, privacy protection and much more. Cheap domain registration with full control and complete access to the domain control panel. 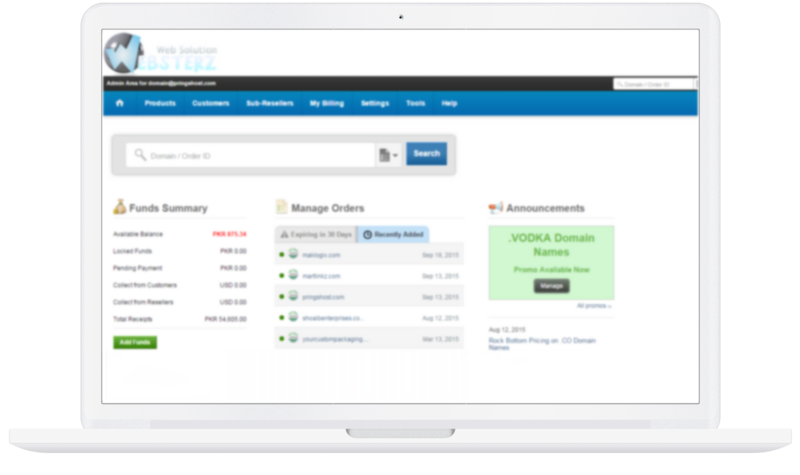 Simple and powerful domain control panel enables you to manage your all domains under single control panel. Manage DNS, manage privacy protection, manage emails, manage contact details and much more. Register your domain in simple 3 steps, instant activation, full control over domain. Manage/Update ownership details. Transfer your domains to us and unlock many features, free dns management, free custom name servers. Advance feature rich dashboard allows to manage your all domains from single powerful control panel. How do i get my own domain name ? Search for availability of desired domain from domain checker tool, if domain is available to register. You can place an order and follow the further instructions provided there. Domain will get expired after renewal date and stop resolving to your hosting account, later after 60 days of redemption period it will get deleted from the system and will be available to anyone for registration. Yes you can register domain if you do not have hosting account, you can use this domain with any free blog hosting provider or any free web hosting services. My registrar is refusing to transfer my domain name. What do I do? You have ask them for possible resolution of problem, as owner/registrant has right to transfer his domain to any new registrar.